Map of the Jamaica Bay Unit of Gateway National Recreation Area. The Broad Channel community is depicted in yellow on the largest island located within the Jamaica Bay Wildlife Refuge section. Broad Channel is a neighborhood in the New York City borough of Queens. It occupies the southern portion of Rulers Bar Hassock (known colloquially as "Broad Channel Island"), which is the only inhabited island in Jamaica Bay, with three thousand inhabitants. The neighborhood stands on Big Egg Marsh, an area of fill approximately 20 blocks long and 4 blocks wide; the community is an inholding within the Gateway National Recreation Area, a unit of the U.S National Park Service. The area comprises several artificial canals separating dead-end residential blocks. It is connected to the rest of Queens by road and subway bridges. Prior to European settlement, the Jameco and Canarsie bands of Lenape Native Americans frequented this area. During the 17th century, Dutch settlers established a community on the island and began harvesting oysters, clams, shrimp, and fish. 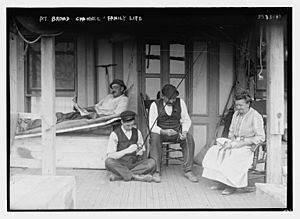 Broad Channel remained a parcel within the town of Jamaica until the consolidation of New York City in 1898. The northern (and larger) portion of the island is part of Gateway National Recreation Area and is managed as part of the Jamaica Bay Wildlife Refuge, the only wildlife refuge in the National Park System. The waters and marsh islands of the refuge entirely surround the community. In 1915, the city leased the island to the Broad Channel Corporation, which in turn leased properties to private individuals for the development of summer bungalows and houses. The island prospered as an exclusive retreat for city residents. After the construction of the Cross Bay Boulevard in 1923, Broad Channel underwent a surge in popularity. In 1938, Parks Commissioner Robert Moses wanted to build a park on the island. His plan was for recreation on the shore with a wildlife sanctuary on the north end of the island. In 1939 the Cross Bay Parkway Bridge opened. That same year, the Broad Channel Corporation declared bankruptcy. The city acquired the island's property titles but, for many years, denied residents the right to purchase the land under their houses. The city made many attempts to alter the island's purpose, but the local community resisted them all. Proposed changes included the construction of a commercial port and the extension of John F. Kennedy International Airport. In 1982, New York City granted Broad Channel residents the right to purchase their property. In 1998, Broad Channel's Labor Day parade received negative media attention after video of a float that parodied the racially motivated dragging death of an African American man was made public. The float carried white men wearing blackface and Afro wigs, and was entitled "Black to the Future - Broad Channel in 2098". Three white participants on the float, two city firefighters and a city police officer, were later fired from their jobs as a result of the parade incident. They sued the city for wrongful termination, and had their claims upheld in federal district court in 2003. Local residents expressed support for and relief at the ruling, hoping that an end to the court battle would help to rehabilitate the image of the town. The United States Court of Appeals for the Second Circuit reversed the ruling in 2006, holding that the firings could stand. St. Virgilius School closed in 2006; in 2008, upon the retirement of its administrator, Rev. John P. Maloney, St. Virgilius Parish of Broad Channel merged with St. Camillus Parish of Rockaway Park, New York. Rev. Richard J. Ahlemeyer, pastor of St. Camillus, remains pastor of the new "Parish Family of Saint Camillus - St. Virgilius Roman Catholic Church." In August 2011, Broad Channel faced its first mandatory evacuation, due to Hurricane Irene. In the aftermath, two homes on Church Road between East 12 and 14th Road collapsed into Jamaica Bay due to the high storm tide. In October 2012, Broad Channel faced another mandatory evacuation; it sustained heavy damage from Hurricane Sandy, with widespread flooding affecting most homes in the area. In subsequent days, widespread prolonged power cuts and shortages of food and water were reported. Press reports indicated that at least parts of the neighborhood were flooded from time to time by high tides. The city has proposed steps (such as raising the streets and sidewalks by three feet), but work has not yet begun. Based on data from the 2010 United States Census, the population of the combined area of Breezy Point/Belle Harbor/Rockaway Park/Broad Channel was 28,018, an increase of 1,307 (4.9%) from the 26,711 counted in 2000. Covering an area of 2,033.88 acres (823.08 ha), the four neighborhoods had a population density of 13.8 inhabitants per acre (8,800/sq mi). The racial makeup of the neighborhoods was 78.3% (21,946) White, 7.5% (2,095) African American, 0.1% (29) Native American, 2.1% (595) Asian, 0.0% (8) Pacific Islander, 0.2% (66) from other races, and 0.9% (259) from two or more races. Hispanic or Latino of any race were 10.8% (3,020) of the population. The IND Rockaway Line has a subway station in Broad Channel, serving the A train and Rockaway Park Shuttle. From the 1950s to the 1970s, some mapmakers have shown the streets of Broad Channel numbered along the same continuum found in the rest of Queens besides the Rockaways, with the numbers of "Streets" increasing from west to east, the numbers of "Avenues" increasing from north to south, etc. However, Broad Channel streets have always had their own numbering format, including "East" and "West" (in relation to Cross Bay Boulevard) prefixed "Roads" numbered north to south, independent of those used elsewhere in the borough. The directional prefixes ensured no duplication with any other "Road" in Queens. There are no numerical north-south or even any named "Streets" in Broad Channel. Broad Channel has four bridges: the tolled, vehicular Cross Bay Veterans Memorial Bridge to the south; the free, vehicular Joseph P. Addabbo Memorial Bridge to the north; and the two IND Rockaway Line swing bridges. Cross Bay Boulevard, the island's only through road, traverses the two vehicular bridges, both of which also carry bicycle and pedestrian traffic. Lying between Howard Beach and the Rockaway Peninsula, it is connected to those communities by these bridges, at either end of the island. Following the construction of the Cross Bay Parkway bridge in 1939, a drawbridge connecting Broad Channel with the Rockaway Peninsula, the island became easily accessible by car. However, the drawbridge opened up many times per day, and whenever it opened, traffic would back up to Howard Beach, as well as on the Rockaway Peninsula. In the mid-to-late 1960s, a new bridge was constructed. It opened on May 28, 1970. 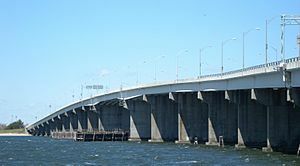 It was renamed the Cross Bay Veterans Memorial Bridge in 1977. It is maintained by MTA Bridges and Tunnels, and a $3.75 toll ($2 with E-ZPass) must be paid to use the bridge. The Joseph P. Addabbo Memorial Bridge connects Broad Channel to Howard Beach and the mainland. Opening in 1993, it was formerly known as the North Channel Bridge. It replaced an older North Channel Bridge built in 1924, which was deteriorated to the point where it was beyond repair. It is maintained by the New York City Department of Transportation, and is free. The non-profit Broad Channel Athletic Club was established in 1961. The baseball teams are registered with Little League and host an in-house baseball league, and participate in the Catholic Youth Organization. The football league plays in the Nassau and Suffolk Football League. The soccer league is completely run by the organization and participates in the Catholic Youth Organization. The swimming team participates in the Police Athletic League and the Catholic Youth Organization. The basketball league also participates in the Catholic Youth Organization. The Broad Channel Historical Society was founded in 1994. Their mission is to document and preserve the history of Broad Channel, often referred to as the "Venice" of New York. The committee was initiated by then President of the Civic Association Danny Mundy, who came up with the idea from reading the "Glimpse of the Past" column in the town newsletter, Channel News. With seed money from New York State Senator Ada Smith, loose-leaf notebooks with plastic sleeves were purchased in order to begin documenting the colorful history of "The Channel". After one year of articles, written memories, and videotaped interviews, they held their first Annual Historical Day in June 1995. This event brings out the townspeople and folks from the surrounding area to enjoy the collection, usually housed in the Broad Channel Public Library. The Queens Borough Public Library has been the home for the historical collection. The collection was microfilmed in 1997. The microfilm is available for viewing at the Central Branch in Jamaica, Queens. Also in 1997 the first annual Historical Calendar was published. The calendars feature old pictures of Broad Channel and tidal information. The department originally started in 1905 as bucket brigade to help minimize property loss due to fires. In 1907, this brigade was formally organized into the Broad Channel Volunteer Fire Association under its first Chief, Edward H. Schleuter. The current firehouse at 15 Noel Road was opened in the summer of 1908. In 1913, Chief Chris Hoobs died of a heart attack responding to a fire. The association received their fire charter from the state of New York in 1917 and were known from then on as the Broad Channel Volunteers. In 1956, then-Deputy Chief Robert H. Russell, Sr. added volunteer ambulance services to provide first aid and ambulatory care to the residents of Broad Channel. He would also go on to be elected to the rank of Chief of Department twenty-one times from 1957–1973, 1975–1977, and again in 1984. By the early 1960s, the department was growing rapidly in both stature in the community and as an organization as a whole. On summer weekends during the 1950s and 1960s, the FDNY would send a spare engine and a crew detailed from other firehouses, known as Engine Company No. 341, to the Broad Channel Volunteers' quarters to assist in answering alarms on the island. The bridges at the northern and southern ends of the island were draw bridges and were frequently opened for large passing ships. The southern bridge was particularly active due to the numerous tankers carrying fuel to nearby Idlewild Airport (now John F. Kennedy International Airport). On average it took from 30 to 45 minutes from the lowering of the traffic barriers, the opening and closing of the lift bridge, and the raising of the traffic barriers before traffic could again move. Occasionally, the bridge would get stuck in the open position effectively closing Cross Bay Boulevard for extended periods. This would impede responses by FDNY apparatus, EMS & NYPD companies to the island for any type of emergency. Also, Cross Bay Boulevard, then 4 lanes in each direction, would be jammed by beach goers and those looking to vacation at Rockaway's bungalows and hotels and its famous Rockaway Playland. Often the FDNY firefighters would leave their apparatus parked on the Boulevard and join the volunteers on their apparatus because they were smaller than the FDNY apparatus and could maneuver down the very narrow streets. Over the years, the Broad Channel Volunteers have been in service, they have created a close working relationship with the local FDNY companies as well as the volunteer companies from Nassau & Suffolk Counties. 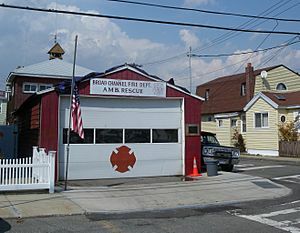 The Broad Channel Volunteers are also dues paying members of many organizations such as the Southern New York Volunteer Firemans Association, the Firemans Association of the State of New York, and along with the 9 other volunteer fire departments in the 5 boroughs of New York City, they are members of Volunteer Firemans Association of the City of New York. In the late 1970s, The Broad Channel Junior Fire Department was organized to help train young teens in the aspects of the fire and EMS service as well as dispatching and clerical duties while still cleaning the firehouse and its apparatus. When its members turned 18, they were allowed to begin riding the apparatus as firefighters or start training as EMTs. The benefit was these teens were already knowledgeable in the operations of the department and it became a breeding ground for the departments future firefighters, officers and chiefs. They would later become a Boy Scout Explorer Post, #3069. In 1994, under Chief Dan McIntyre, the volunteer ambulance corps was granted their New York State Certification. Since then, the department took the initiative to require all its firefighters to be New York State Certified in all aspects of the fire service as well as EMS. In 1994, Chief Dan McIntyre also started the departments Marine Company which is still in service to present day. The department operates a small Coast Guard-like Zodiac as a swift water rescue team with certified EMTs on board and in some instances certified divers as well. In 2012, as a result of Hurricane Sandy, the fire department lost many resources, including both of its fire trucks and both of its ambulances. Therefore, a replacement fire truck from Chanhassen, Minnesota, was loaned to the Broad Channel Volunteer Fire Department. In addition, neighboring Minnesota towns sent resources, including extra boots and helmets from Victoria and Carver; four air monitors, one Jaws of Life apparatus, and two power generators from Chaska; and a truck with resources worth about $20,000 from the Sioux community there. The Broad Channel Volunteers, Inc., is a 501(c)3 not-for-profit organization that relies solely on door to door fundraising, grants from politicians and from the state, and since 1905 has been operated by 100% volunteers. 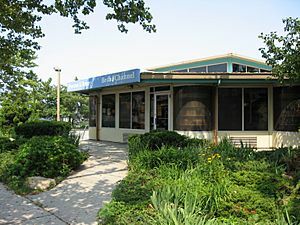 Broad Channel Park opened in May 1995, located at the southernmost end of Broad Channel, sits along Jamaica Bay. The park features two grass baseball fields, one asphalt baseball field, benches, water fountains, a parking area, four basketball standards, and a small play area. The flagpole area is surrounded by a nautically themed sitting area. The park was given its present name in March 1998. This playground is named in honor of Broad Channel community activist Eugene Gray (1927–1973). Gray was born on March 14, 1927 in Park Slope, Brooklyn and later moved to Hell's Kitchen in Manhattan. After attending college, Gray married Lorraine Baker (1929–1977) with whom he had three children: Michael, Gary and Gregory. Gray later moved to Broad Channel and became involved in various neighborhood youth programs, including the Broad Channel Athletic Club, an organization for which he served as president. A community football coach for more than twenty years, Grey also helped to shape and maintain the Broad Channel football league and assisted in the creation of the local Teen Club, which provided safe recreational activities for the area’s youth. Before his death on September 14, 1973, Eugene Gray also supported the construction of this site, the first adventure playground to be built in Broad Channel. In recognition of his dedication to the playground’s construction and lifetime of work for the neighborhood’s youth, the Broad Channel Civic Association and Queens Community Board 14 motioned to have the playground named in Gray's honor. Their undertaking was successful in 1987, when a local law passed naming the park Gene Gray Playground. Located on the corner of Cross Bay Boulevard and East 9th Road, Gene Gray Playground opened on November 12, 1987 and was built at a cost of $457,688. In honor of Broad Channel's seafaring past, award-winning architect Richard Dattner incorporated a nautical fortress theme into the park's wooden play equipment. The playground contains a walkway bridge intended to resemble a sailing ship, complete with bow, stern, and gangplank-like ramp. The park also contains a 75-year-old willow tree (Salix spp. ), nine red maple trees (Acer rubrum), and ninety burning bushes (Euonymus atropurpureus) along the perimeter. Broad Channel, Queens Facts for Kids. Kiddle Encyclopedia.